This web page, No.1 in a series of 3, includes accounts of research that "drew a blank" during our investigations. These side-tracks have been left on our website as a guide to others who may be researching similar situations. Recent updates include significant amendments arising from discovery of precisely where and when the bodies of the crew of MM838 were found and where their remains were (or, more to the point, were not) taken prior to reaching their final resting place in Belgrade War Cemetery. Also included are updates arising from the identification of EW160 as the aircraft that crashed on Čibuklija Island and a broader analysis of the German’s crude oil shortages. Beaufighter Mk.VIF serial MM838 was shot down on the night of 31st August / 1st September 1944, currently thought to be the only aircraft of No.255 Squadron ever to have been brought down by flak. Only once the advancing Red Army had expelled the Germans from the vicinity (circa 8th October 1944, some five weeks after the crash) did a realistic possibility for investigation arise. All that was known up to that point was that the Beaufighter did not return to its base in Foggia, Italy, from an intruder mission into the Middle Danube Basin. In fact, investigations took very much longer. 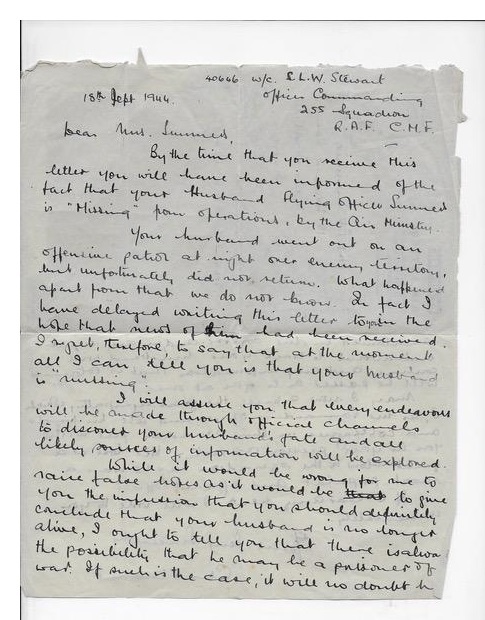 The official letter to the pilot’s widow from the Air Ministry Casualty Branch, confirming her husband’s death, is dated 20th August 1945, nearly a year after he died. It accurately identifies the crash location by correctly naming the nearby village of Dubovac. However, it falsely claims that a burial had taken place at Kovin, with full military honours. That claim was attributed to information said to have been supplied by the Yugoslavs. In fact, at the time the letter was written, the bodies still lay in the woods to the east of Dubovac, in unconsecrated ground. According to disclosed RAF records, the crash itself killed both crew members, 127208 Flight Lieutanant James SUMMERS, Pilot, and 140887 Flying Officer Cecil John SANDERS, Navigator/Radar Operator. However, the precise fate of this crew is today a matter of some doubt. Local oral history suggests that both survived the crash but later fell victim to conflict between rival guerilla groups. Which account is correct is a matter yet to be resolved. In part, confusion arises from a second Allied loss in the same area involving a 4-engine bomber, Liberator Mk.VI serial EW160. The location of that crash has previously been documented as Draž (now in Croatia), but new evidence proves that to be incorrect – EW160 was the aircraft that came down on Čibuklija Island. Investigations continue into the possibility that 623995 Flight Sergeant Robert Edgar NORTH of No.178 Squadron RAF, EW160’s Air Bomber, was (or was also) the victim of action contrary to the provisions of the Geneva Conventions. Either as a direct consequence of the crash or as a result of being shot after exiting the aircraft, his body was found floating in the River Danube on 1st September 1944 at a position documented by CWGC as Veliko Gradište, which is the next town downstream of Ram Quay. This was a matter of hours after the nearby crash of MM838; hence the confusion between the two incidents in folk memory. Local civilians would have had no way of knowing which bodies came from which aircraft. But the key point here is that disproves the theory that EW160 crashed near Draž. That would imply F/Sgt North's body drifting over 300km downstream in a timespan of four days. 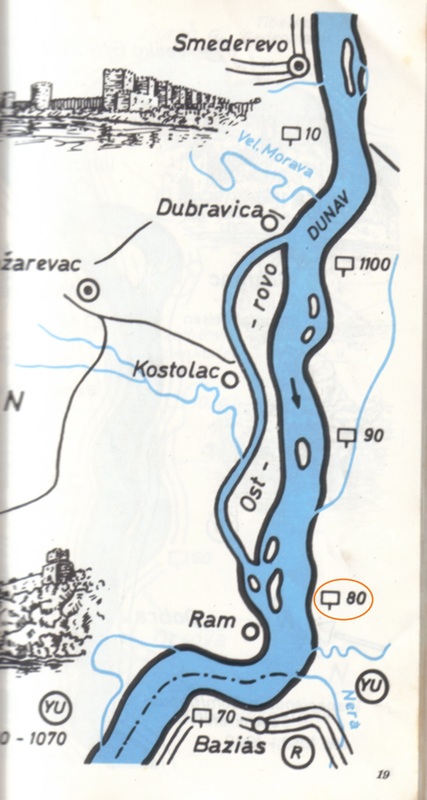 The sketchmap reproduced here illustrates a 50km length of the Danube Waterway from Smederevo in Serbia (formerly part of Yugoslavia) to Bazias in Romania. North is to the right (thus West is at the top) and the flow of the river is top to bottom. A line drawn from Ram to Bazias approximately identifies the upstream end of one of the Danube’s two major gorges (the one known as the Iron Gates Gorge), a major geological feature of this part of South-East Europe that extends for approximately 145km downstream. Below Ram and Bazias, the sides of the gorge rise typically 200 metres or more, in places direct from the water. Upstream and to the north, the land alongside the river is by comparison low-lying and characterised by "Karst" – limestone pavement – interspersed with a light, sandy soil. To the south of the river, especially around Kostolac (Костолац), there are shallow deposits of brown coal (lignite) which, since the 1960s, have been open-cast mined for the purposes of electricity generation. The nearby power stations did not exist at the time of the Squadron’s loss of MM838. The Danube had, for many years before WW2, been designated an International Waterway, since 1856 under the control of the Commissions of the Danube. That body was created by The Treaty of Paris at the end of the Crimean War. The Commissions first addressed the huge hazards to navigation that existed in the Danube Delta. It was not until 1918 that work on improving navigation further upstream commenced. One consequence of the internationalisation was the creation of a continuous run of marker posts at 1km intervals, starting at the Black Sea and extending upstream to the head of navigation. Note that, uniquely amongst European rivers, the Danube is calibrated with the 0km point at the mouth of the river on the Black Sea coast of Ukraine, not at the source. Each 10km these marker posts show on the sketchmap displayed here, most labelled with just the last two digits of their full number. The one of interest to us is labelled "80" (actually 1080) and ringed in orange. 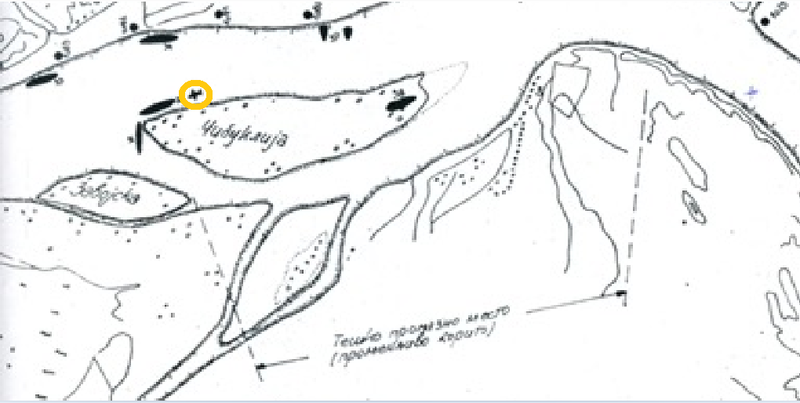 Note that it is fully 20km downstream of Dubravica (Дубравица), which the Mare Nostrum report from the month of July 1944 tells us was supposed to be the downstream limit of the Squadron’s operations. Whether those orders had or had not been amended in the intervening weeks is unknown. Since August 1944, the maximum water level in the vicinity of Ram has been raised by typically 5 metres. This is attributable to the hydro-electric dam "Iron Gate 1" ("Đerdap 1") built 1964–1972 and located near the bottom end of the gorge. Consequent changes both in the natural course of the river and in the dredged channel have brought about repositioning of many of the marker posts, in some instances posts being replaced by bouys. Full details of these changes, including data adjustments of historic surveys to correct to WGS84 Datum, have been supplied by the Department of Transport of the Republic of Serbia. This is a major contribution on their part for which 255 Squadron Association is immensely grateful. The general rise in water level caused by the dam has resulted in much of the land adjacent to the river becoming marshy and overgrown, with few opportunities for landing by boat. In parts, the banks resemble a mangrove swamp. Daily reports of river levels are available online from the Romanian monitoring station at Bazias, just a few kilometres downstream. 24 January 1944 : 255 Squadron arrived at Foggia, Italy, from Grottaglie. Operations at Grottaglie continued, but were downgraded to Detachment status. 14 May 1944 : Summers and Sanders joined 255 Squadron as an already-paired aircrew, arriving from No.1 Base Personnel Depot. May 1944 : 255 Squadron began Intruder Patrols, resuming aggressive operations for the first time since attacking targets in Sardinia in the Spring of 1943. All activity in the intervening year had been defensive. Intrusions into Yugoslavia were, at first, in coastal areas only. Night of 29-30 June 1944 : Squadron's intruder patrols into the Danube basin commenced in earnest. The principal objective was to disrupt transport of crude oil from Romania. 05 August 1944 : James Summers promoted to Flight Lieutenant (War substantive). Gazetted 25th August. 20 August 1944 : Meeting between Milan Nedić (Serbian Government of National Salvation, collaborationist, backed militarily by the Serbian Volunteer Corps) and Dragoljub "Draža" Mihailović (Chetnik guerilla leader, nominally pro-Monarchist) at which they agreed the outline of a joint campaign against Partisan (pro-Communist guerilla) forces. Note that Kovin, Dubovac, Ram and Veliko Gradište were all within territory nominally controlled from August 1941 to October 1944 by the Government of National Salvation, a puppet régime serving the interests of Germany. However, many woodland and uninhabited areas were in fact in the hands of the Partisans. 20-29 August 1944 : The "Jassy–Kishinev Operation", a major breakthrough by the Soviet army, effectively wiped out the German 6th Army in Eastern Romania and initiated the German withdrawal from the whole of the Balkans. Night of 23/24 August 1944 : The "Royal Coup", led by King Michael, resulted in Romania changing sides in the war. This meant that German forces suddenly faced possible military opposition in the immediate vicinity of Bazias. The Red Army’s battlefront was fully 500km further east, but the enclaves of trained, newly hostile Romanian troops on the Romania/Yugoslavia border potentially explain why German forces in both Ram and Dubovac might have been a bit trigger-happy on and from this date – not to mention the Germans being unwilling to expend time and scarce fuel searching for the bodies of enemy casualties. Night of 27/28 August 1944 : No.178 Squadron Liberator bomber EW160 failed to return to base; mission was to lay mines in the River Danube. The aircraft took off from Amendola, Italy, carrying six 1000lb Mk.V anti-shipping mines. There is some suggestion that the German vessel Uta was involved; a Romanian quote of translated German KTBs reports "Supply ship Ute [sic] shot down one mine-carrying plane on the night of 27 Aug." The same document also reports skirmishes on 28 August between German and Romanian forces as far upstream as km post 1072. 30 August 1944 : Soviet army entered Bucharest, the capital of Romania. Evening of 31 August 1944 at about 22:30 local time : MM838 lost. "Missing from Intruder Patrol over Danube Basin and Belgrade area" and "Take-off time 20:40 from Foggia Main. Aircraft failed to return". 01 September 1944 : The body of 623995 Flight Sergeant Robert Edgar NORTH of No.178 Squadron RAF, EW160’s Air Bomber, was found floating in the River Danube at a position documented by CWGC as Veliko Gradište. He was initially buried in the civil cemetery of that town, only after the war being exhumed and moved to Belgrade War Cemetery. Night of 04-05 September 1944 : Last attempt by 255 Squadron at Intruder operations into the Danube Basin. By the time of the next Full Moon, closure of the Danube waterway meant that there were no more loaded oil barges to attack. Week of 04-10 September 1944 : The Danube remained open for navigation until passage was blocked at Prahovo (219km downstream of Ram) by the scuttling of approximately 130 to 200 vessels (reports vary) that the Germans were no longer able to return upstream through the Iron Gates Gorge to the Fatherland. Most notable of these was the Military Hospital Ship BAMBERG, sunk 7th September 1944. 09 September 1944 : Coup d'état in Bulgaria, leading to that country also changing sides in the war. Bulgarian troops subsequently ally with Yugoslav Partisans for a joint assault on Belgrade from the South-East. 12 September 1944 : Official armistice between Romania and СССР (USSR, the Union of Soviet Socialist Republics), the USA and the UK, formalising a ceasefire effective 24th August 1944 at four AM. 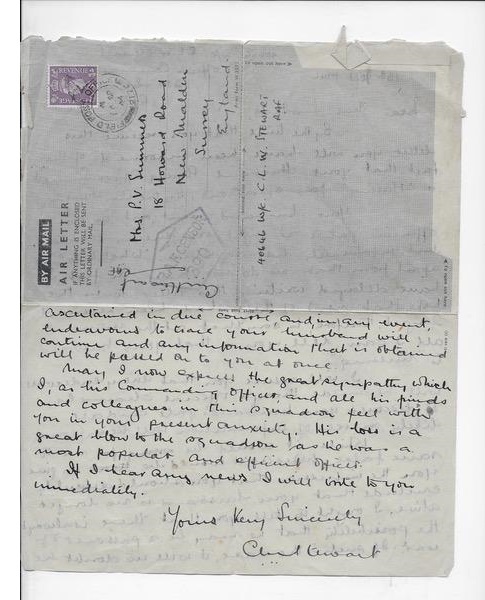 18 September 1944 : 255’s CO wrote to Phyllis Summers regarding the lack of news of her husband. On or about 08 October 1944 : Soviet forces over-ran the crash site of MM838 near Dubovac. There is as yet no known evidence of either the Wehrmacht or the Red Army finding the casualties, graves of any description or the Beaufighter’s wreckage. 20 October 1944 : By this date the whole of Belgrade (Beograd) was in the occupation and control of pro-Soviet forces, placing the main battlefront about 100km west of the crash site. January 1945 : Anthony James Summers ("Tony", James Summers’ posthumous issue) born. 08 March 1945 : A coalition Yugoslav government was formed in Belgrade with Josip Broz Tito (SKJ, the Communist Party of Yugoslavia) as Prime Minister and Ivan Šubašić (Croatian Peasant Party) as Foreign Minister. Fragmented parts of Bosnia, Croatia and Slovenia remained under German occupation. Note in passing 255 Squadron’s connection with another Eastern European Peasant Party. Tibor Eckhardt, leader of the Hungarian Peasant Party, was the stepfather of 60526 Squadron Leader Robert Merton GRAHAM, killed 10.Sep.1943. June 1945 : Personal property of the deceased aircrew of MM838 handed to the British Air Attaché in Belgrade by representatives of the Yugoslav coalition government. 20 August 1945 : Air Ministry Casualty Branch wrote to Phyllis Summers confirming that James lost his life “as a result of air operations” on 31st August 1944. The letter mentions return of James’ identity disc (singular). This so-called ID disc, when returned to the family, turned out to be an engraved wristband rather than the standard two-part "Dog Tag" supposed to be worn by all British Military personnel. 15 May 1946 : British Army personnel recovered the bodies of Summers and Sanders from woodland near Dubovac. 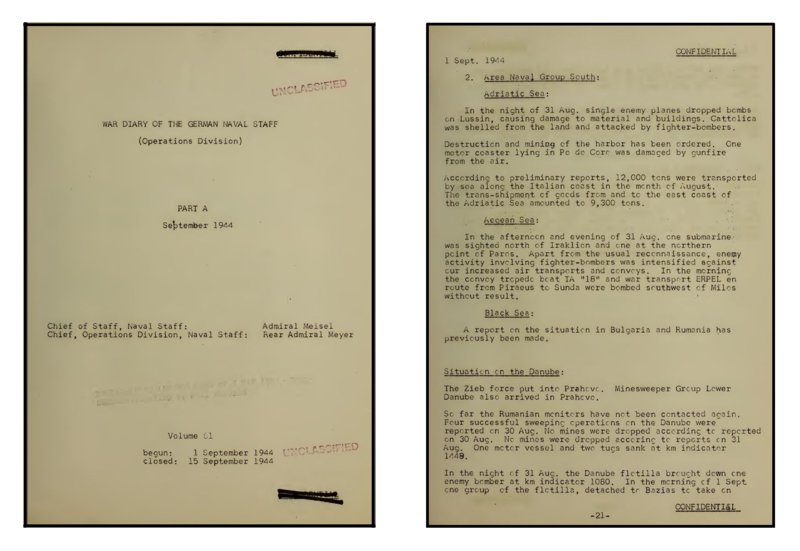 Resulting paperwork prepared by Major Ronald George DAKIN, Deputy Assistant Director, Graves Registration and Enquiries (Yugoslavia), shows that Summers was identified "by discs" (plural, implying that both his official discs were still with the body). Sanders’ ID discs were not found. Both were then buried at the British Military Cemetery, Belgrade, in adjacent graves 1.A.9 and 1.A.10. It is at present unclear whether a formal burial ever took place at the woodland site in 1944. What is clear is that Summers and Sanders were never buried in the town of Kovin, some 25km away. The pre-printed paperwork is prominently amended to read "Direct Consolidation", indicating direct transfer from the field of battle to a military war cemetery without interim interment in and exhumation from a local civilian cemetery. Jan/Feb 1947 : The British Military Cemetery in Belgrade was moved. In the course of about five weeks, all bodies were exhumed and re-buried at the new site. There is some confusion regarding the notification received by Mrs. Summers on 7th February 1947 – did this refer to the move of her husband’s body from Dubovac to Belgrade in May 1946, or the relocation within Belgrade, or both? 25 August 1947 : The RAF’s MRES (Missing Research and Enquiry Service) commenced operations in Yugoslavia . Some criticism of the British Army Graves earlier work was voiced, especially on account of failure adequately to examine and document aircraft wreckage. 01 June 1948 : Phyllis Summers remarried (Slade). 1964–1972 : Construction of the "Iron Gate 1" ("Đerdap 1") hydro-electric dam, which raised maximum water levels in the Ram area. “Our son is very proud of his father’ record, although he was born five months after his father died and never knew him. When this website’s Roll-of-Honour page was first being created, Air Historical Branch at RAF Northolt were approached and asked for details of the incident in the Danube Basin. The P.4(Cas) files still being subject to a standardised 82-year closure, little new was disclosed save for the assertion that the bodies had been recovered by Partisans rather than the Germans and buried at Kovin, later to be exhumed and re-buried in the CWGC cemetery in Belgrade. This subsequently proved to be incorrect in several respects. The next development was an approach from Peter Kaššák in 2016, during research for his book Gardening by Moonlight. Peter’s initial request was for previously unpublished photographs of 255 aircrew, which Chris Eley gladly supplied from his late father’s personal collection. Almost as an aside, the correspondence also led to discovery of an entry in the top-level Kriegsmarine records relating to a "Bomber" being shot down by two German vessels moored at Ram. The image below reproduces a US Navy Intelligence translation of the Kriegsmarine KTB (War Diary) for the first half of September 1944. The vital clue to the loss of MM838 is to be found in the final paragraph on Page 21: “In the night of 31 Aug the Danube flotilla brought down one enemy bomber at km indicator 1080”. Allied records show no bomber losses in the Balkan theatre of operations that night; it is presumed that the Beaufighter was mis-identified as a Wellington. Extract from US Navy translation of captured Kriegsmarine records. Still missing was precise detail of the location of the crash (on land or in the water?) and the identity of the German vessel or vessels involved. The obvious place to look next was the lower-ranking KTBs, perhaps those of the Donauflottille or even individual vessels within that flotilla, on the presumption that they would show greater detail. But all advice received suggested these KTBs had not survived the war. Suspicion initially fell upon two German Schnellboot, S86 and S89. These were heavily armed high-speed craft with planing hulls, often mis-labelled E-Boats in English documentation. Back in November 1943, Admiral Dönitz had ordered that six S-Boats were to be sent to the Black Sea to bolster the German naval forces present in this theatre. The Führer der S-Boote (FdS), Kommodore Petersen, had objected to this, arguing that it would weaken his North Sea and Channel forces. Eventually four older craft, S86, S89, S92 and S98, made the mammoth journey by river and overland from the Baltic to the lower Danube. In those days there was no through route by canal. A German Schnellboot (Sister ship, S65). Photographer unknown. By the 20th August 1944, S86 and S89 were somewhere on the middle Danube where, apparently on the initiative of their own commanders, they joined with the German’s Danube Flotilla to assist in the rearguard fighting and delaying actions aimed at frustrating the Jassy–Kishinev advance. This activity came to a halt when S86 was damaged by a mine just south of the km 950 mark. The damage was not too serious and the decision was taken to return both boats to Linz, Austria, where S86 could be repaired. Given their heavy armament and known presence in the vicinity, suspicion fell on S86 and/or S89 as being responsible for the shooting-down of MM838. However, more a detailed investigation into the whereabouts of these S-Boats suggests that they passed the Romania-Yugoslavia border at Ram at 20:45 on 28th August and at the time of the strike on MM838 three days later they were anchored along with the tug Cosmos at km post 1217, over 130km upstream. Suspicion next fell upon a more sedate but also well-armed craft, Sperrbrecher-192. This vessel was built in Regensburg, Germany, with twin 200hp MAN diesel engines. Launched in 1924 and originally named named Kepler, according to ship lists of the Bavarian Lloyds Register, this displacement-hull vessel was originally 61 metres LOA, 8.1 metres beam and 2.5 metres draft. In 1942/43 the cargo-carrier was converted to a minesweeper and anti-aircraft gun platform. In military configuration, she had a ship’s complement of 40, a top speed of a modest 10 knots and had gained 2 metres in length. Reported figures for displacement tonnage vary. Sperrbrecher-192. Isometric view of model and photograph of foredeck (camera on wheelhouse roof). The cruciform protrusions are components of the Italian-designed CAM (Canona Antimagnetica) minesweeping system, effective at 40 metres range when used to detonate the type of magnetic mine being dropped by 205 Group in this area. Great care needs to be taken with the identity of this vessel. More than one civilian craft previously named 'Kepler' was requisitioned and converted to join the Sperrbrecher fleet. Another became Sperrbrecher-177, a seagoing vessel that operated in the vicinity of Keil. For a while it was wrongly assumed that flak from Sperrbrecher-192 brought down MM838. The vessel’s KTB (if it ever had one of its own) appears not to have survived the war although the craft itself did, eventually being scrapped in 1969. But then came the breakthrough. Correspondence generated by a post to the online discussion group forum.axishistory.com resulted in an e-mail to your scribe attaching copies of the missing KTBs, sent by the researcher Martin Goretzki. These copies did not come directly from the originals, but from properly cited microfilm copies languishing, untranslated, in the National Archives of the USA. In view of the huge importance of this documentation to the enquiries into the loss of MM838, the relevant entries are reproduced here in full, as images of the original German followed by the English translation. Evidence source: US National Archives. Colloquial translation: "Iron Gates Group: Uta and Bechelaren shot down one low-flying enemy aircraft (Type Vickers Wellington) near km 1080, hit the ground and exploded. Stormtroop unit sent out. It could not be recovered." The next step in the investigation involved determining just where the vessels Uta and Bechelaren were when they fired at MM838. One possible interpretation of the German word "Bereitschaft" is "on standby". By studying the previous month’s KTB entries it has now been determined that both vessels were moored at Ram rather than at Bazias or under way on the river. The same incident was also documented by the Inspectorate of Mine Clearance. Evidently word did not reach them until 16:50 on the 1st. Beware of the consistent mis-spelling of Bechlaren/Bechelaren in their records. Colloquial translation, with name error corrected: "16:50 - Iron Gates Group: At 22:30 on 31.8.1944 the vessels Uta and Bechelaren shot down one low-flying enemy aircraft (Wellington Bomber). Crashed on land NW of Km 1080. No dropping of mines observed." Crash location: The sentence "Crashed on land NW of Km 1080" in the KTB suggests an impact point inland from the north bank of the main channel. That runs contrary to some civilian eye-witness accounts and post-war dredging records, but it does tally with British Army records relating to recovery of the bodies of Summers and Sanders. These specifically mention recovery of the pilot’s identity discs and the navigator’s badge of rank from a location inland from the north bank and within Vojvodina. The only way in which both accounts could be correct is if two RAF aircraft, not just one, crashed roughly within the triangle bounded by the villages of Ram, Palanka and Dubovac. A complex enquiry into the identity of the second aircraft eventually led to the conclusion that the wreckage of EW160, a B-24 Liberator, was what lay amidst the tangled and flooded stumps of trees on Čibuklija Island. The situation is further complicated by the suggestion that a Soviet aircraft also came down in the Danube in the second half of August 1944, ditching in the main navigation channel closer to Dubovac. Why did the Germans mistake a Beaufighter for a Wellington? It is a well-recognised problem with witness testimony that people tend to report what they expected to see, not what they were actually looking at. The mine-laying aircraft of No.205 Group were predominantly Wellingtons. So when a twin-engine Allied aircraft turned up in the dark, there would have been a natural tendency to label it as just another Wellington. The gun crews of vessels of the Donauflottille may never previously have seen a Beaufighter, thus failing to distinguish the two by reference to the somewhat longer nose of the Wellington – a distinction lessened by the "thimble" nose cone on a 255 Squadron Beaufighter concealing its centimetric radar. At night some attention may have been paid to engine noise. MM838 had Bristol Hercules radial engines. So did Mk.X Wellingtons, the similar sound then adding to the confusion. This document has been submitted by Shaun Stewart, son of the late Squadron CO at the time, having been found in his family archive. Undated in the original extract (this being pp.10-11 of the original), the draft was probably written in mid-July 1944. Full moon was 06.July.1944. It describes in greater detail than the ORB the background against which 255’s missions took place. This account of 255 Squadron Intruder Operations in the last moon period, prepared by the Squadron, is more complete than the accounts prepared from the daily Operations Summaries and is reprinted as written. During the 10 day moon period 12 successful patrols were flown over the Danube basin area on 6 nights and on a bad weather night in the Belgrade area two Beaufighters flew up the Dalmatian coast as far as the Istrian Peninsular. On 4 nights out of the ten the intruders had to turn back owing to cloud banks and valley mists obscuring the entire Danube Basin. The average round trip was 900 miles and our aircraft climbed to 10,000' safety height over the Yugoslav mountains before coming down to 1,000' at their pinpoint in a bend of the Sava River 315 miles from Foggia. 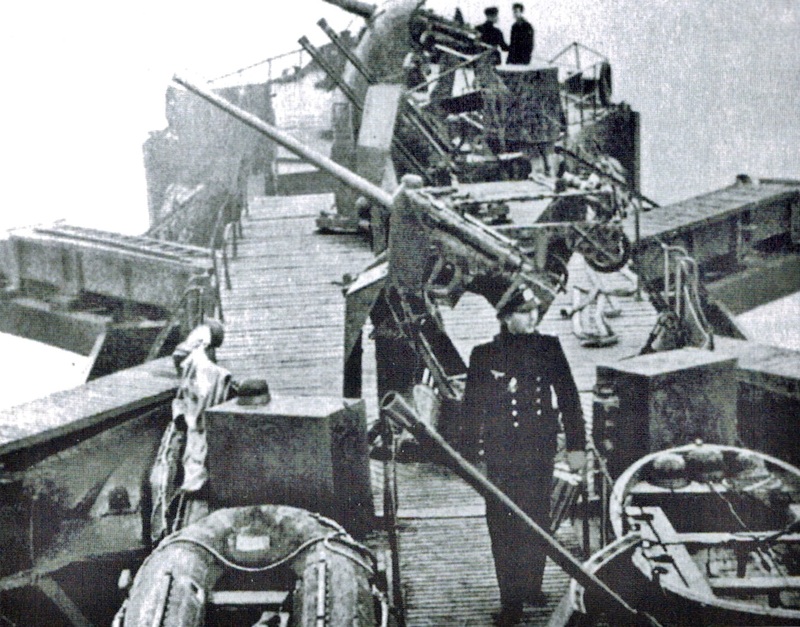 The primary purpose of the missions was to attack river craft with cannon fire which, in conjunction with mine-laying activities by Wellingtons and Liberators, was designed to pulverise barge traffic. Trains and MT [Motor Transport] were also to be counted as fair game, although aircraft were in no circumstances to be attacked. Our patrols covered the Sava River, from Bos. Samac (4504N 1828E) approximately 190 miles eastwards to its confluence with the Danube, and the Danube from Baja in the North (4612N 1858E) approximately 250 miles downstream to Bubravica (2103E 4443N) [sic, read as "Dubravica (Дубравица) 44°43'N 21°03'E"]. The pioneer aircraft to make the first night strafing attacks on 29/30 June met with immediate success, for an attack on one barge cluster at N. Slankament [sic, read as Stari Slankamen. Novi Slankamen does not front the river] resulted in terrific orange and red explosions and fires as the 200' oil barges blew up. A mounting pall of oil smoke had reached 1,000' in 15 seconds and 10 hulks could be seen burning fiercely down to the water line from 45 miles away. Four other barges and a tug were well shot up on the same night, all without any opposition from ground defences. This attack was reported by German Radio as “a medium bomber raid causing some slight damage”. The roads and railways in the intruder area were all completely deserted and remained so throughout the moon period. Little was known of the country before this first trip. One pilot describes it as for the most part rich farming territory and unfavourable for escape and evasion purposes owing to the open nature of the fields, frequent habitation, the fact that the woods shown on the map are mostly only scrub and very boggy and also because of the large natural barriers presented by the rivers which run through the many ox-bow lakes and marshy country. On the night 30 June / 1 July the aircraft turned back due to overcast over the target area obscuring the moon, but on the following two nights a very good bag was obtained, varying degrees of damage being inflicted on forty-five 1,000 ton Rhine-type barges, three tugs, and nine smaller craft. In addition a large vessel 300' long by 60' beam with superstructure, which was seen jutting out from its mooring into the stream, was attacked heavily with three long bursts of cannon fire and left severely damaged. After the first night’s successes a certain re-organisation seemed to have taken place in the Hun’s ground defences, and AA opposition progressively increased from now on. Also on night 1/2 July two Beaufighters were illuminated at low level suddenly and accurately by searchlights on either side of the river and as no flak opened up simultaneously, it was presumed the searchlights were radar controlled and being used as directional aids to night fighters. It was heard later that the Hun had identified our aircraft as Marauders following the searchlight exposure. There was found to be a balloon barage at 1,000' over Zemun (Belgrade) in addition to the one known to exist at Novi Sad. During the next four nights only one aircraft intruded over the Danube area, damaging a 300' barge. Weather conditions during this time obliged other intruders to turn back as they could not find their pinpoints on the Sava in 10/10ths cloud and river mist. As an alternative on 5/6 July two aircraft set off up the Dalmatian coast to make for Trieste, via Fiume and the Istrian peninsula. The trip proved rather too long, but on the coastal strip of Yugoslavia three motor transports (including one 3-tonner) were destroyed and one damaged and three very determined attacks on a 200' steamer underway off Rab Island left it glowing and smoking and later it appeared to be beached in a small bay. A 200' barge was damaged near Fiume. Considerable accurate 40mm flak was encountered from the Southern tip of the Istrian Peninsula especially in the neighbourhood of Pola where several flak ships opened up. For the last two nights the intruders reverted to the Danube Basin area, in four sorties damaging one tug, eighteen 200' Rhine Barges (1,000 tons), and six 100' barges. 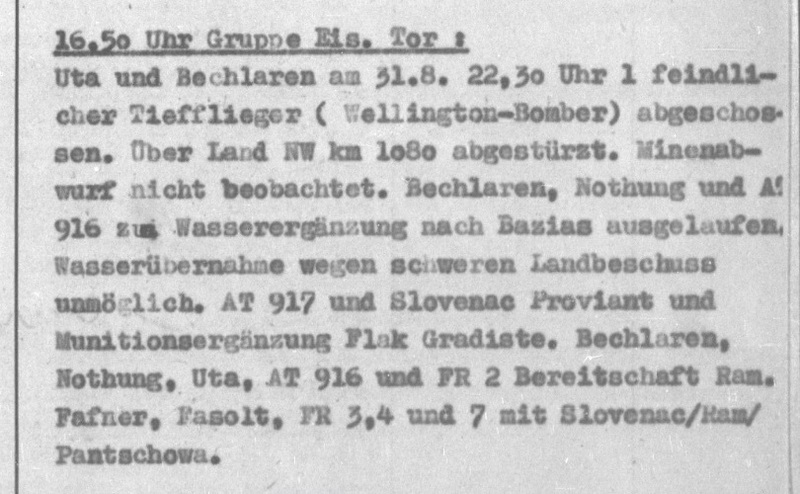 The assumption that the enemy was using nightfigthers in the area was confirmed, for a probable nightfighter was sighted at long range for the second time and at Shbac [sic, probably an error for Šabac 44°45'N 19°42'E] two of our aircraft saw green rockets which passed close on either side of one Beaufighter flying at 1,500' and exploded ahead with greenish white puffs after passing in level flight. A further point of interest is that our aircraft could hear themselves being swept by enemy radar over the R/T whilst in the intruder area and judging by the strength of the pulses the radar station was probably situated on high ground South of Belgrade (not thought to be either the Brod or Vukovar installations). In all at least eight big oil barges and their cargoes were destroyed and varying degrees of damage inflicted on 102 other waterborne craft representing something like 100,000 tons of river transport. A naval specialist estimated that a 20mm cannon shell would make an appreciable hole (approximately 9 inches in diameter) in the thin stressed plating of a 200' Rhine (1,000 tons) type barge, putting it out of commission for a time and overloading repair yard facilities. In most cases where damage is claimed chunks were seen to fly off, and momentary glows started in the barges. Over approximately the same period as these operations the Squadron has destroyed 2 Ju-88 low flying recces, 7 Ju-87s over Ancona and damaged a further Ju-87. All these successes have been accomplished without loss, added to which the Squadron did not have a single accident in June. The global strategic situation in which the Middle Danube campaign was conducted should be seen in the context of the records of the Hartley Committee (officially "The Technical Sub-Committee on Axis Oil"). Romanian crude oil is waxy and prone to solidification at low ambient temperatures. Nevertheless, end products derived from it it were significantly cheaper to produce that synthetic substitutes derived from Lignite (Brown Coal) or Black Coal using either the Hydrogenation (Bergius) or Fischer-Tropsch processes. At peak production (1943), German synthetic products manufactured within that country’s pre-1939 borders comprised at most half of the military demand and left nothing either for civilian purposes or for revenue-earning export to neutral countries.. Thus importation of either crude oil or refined products from occupied territories was, for the Germans, an absolute necessity. Declassified intelligence reports confirm that in the summer of 1944 Smederevo had a functioning oil refinery, albeit one of modest size. This facility was the subject of photo-reconnaissance by No.682 Squadron done with the objective of determining the effectiveness of bombing sorties targetting the refinery. Less that 100 hours after the loss of MM838, such a sortie by No.682 Squadron took place, but the photographs that survive show only the refinery itself, not the river banks as far afield as Ram some 35km distant. Archive indexes suggest that the river port of Bazias was photographed in January 1945. This complete photo-set survives in the NCAP archive in Edinburgh, but present indications are that the crash site of MM838 is about 2km off the western edge of the area photographed. Here is the Synoptic Chart for 00:00Z 01.Sep.1944, courtesy of the archives of Metcheck.com. General Synopsis at 00:01z Friday 01 September 1944: High, Azores, 1024 steady. High, Sea of Azov, 1018 declining and losing its identity. Low, Stockholm, 988, with associated frontal trough Bergen to Scapa Flow to sea area SW Iceland, moving rapidly NE expected Murmansk, 993 by 00:01z Saturday. New Low expected Central England, 1002, by the same time. Area forecast for the Middle Danube for the 12 hours commencing 18:00z Thursday: Surface wind between Calm and South-Westerly Beaufort Force 2 (a "Light Breeze", just sufficient to move weather vanes), occasional mist patches in local inversions, no precipitation and a freezing level of about 12,000ft. At most a scattering of high cirrus cloud. QNH 1018 steady. 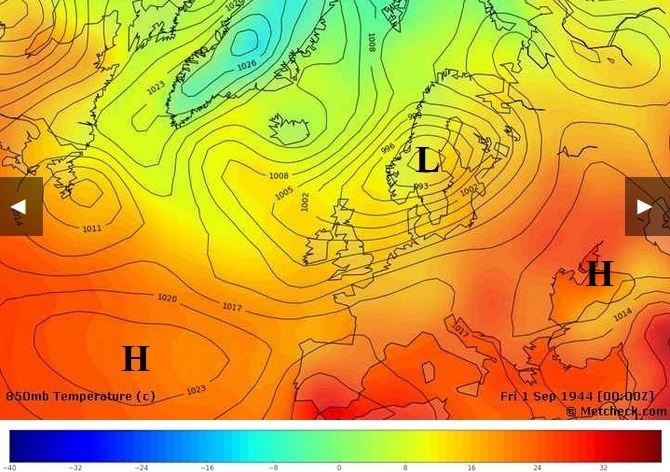 When dealing with weather predictions from this era, it is necessary to bear in mind that the existence of the Jetstream was unknown and that the full significance of weather fronts was a matter of academic contention. Some forecasters, especially those trained in the USA, downplayed the significance of fronts and attempted to match pressure patterns to past similar events, then using subsequent weather reports as a guide to the short-term future. Moonrise over target, 31.August.1944: 16:00z, 18:00 local daylight saving time, bearing 118°. Moonset over target, 01 September.1944: 01:44z, 03:44 local daylight saving time, bearing 244°. 92% of the all-time maximum visible disc was illuminated on the night in question. Furthermore this was a "supermoon", the earth-moon distance at Full Moon on 02 September 1944 being 357,308km as against a theoretical minimum (Perigee) of 356,355km over a five thousand year period, resulting in this Moon Period delivering some of the brightest moonlit nights of the century. Anything less than 367,607km is generally classified as a Supermoon. Calculated brightness is 1.157:1 (15.7%) brighter than a Full Moon at the Moon’s mean distance and 1.293:1 (29.3%) brighter than a Full Moon at Apogee. A chart was submitted by the Republic of Serbia Dept of Transport suggesting the existence of aircraft wreckage on the NW shore of the island of Čibuklija. This information tallies with information submitted by the operator of the Dunav Trans ferry boat at Ram, who reports that a subsidiary island of silt formed around the aircraft. but before construction of the Iron Gate 1 dam. Image courtesy of Republic of Serbia Dept of Transport. This find tallies precisely with the oral testimony of locals attending the community meal in Ram in April 2018, giving rise to the thinking that two aircraft must have come down in the area during WW2. A local eye-witness to the crash on Čibuklija Island, a teenager at the time, spoke of a 4-engine bomber and three English-speaking survivors – neither recollection tallying with that aircraft being a Beaufighter. Nor does it concur with the German Donauflottille KTB account of the 31th August 1944 incident ending with a crash and explosion on land to the north-west of kilometre post 1080. In the end. both sets of evidence were proved to be correct. 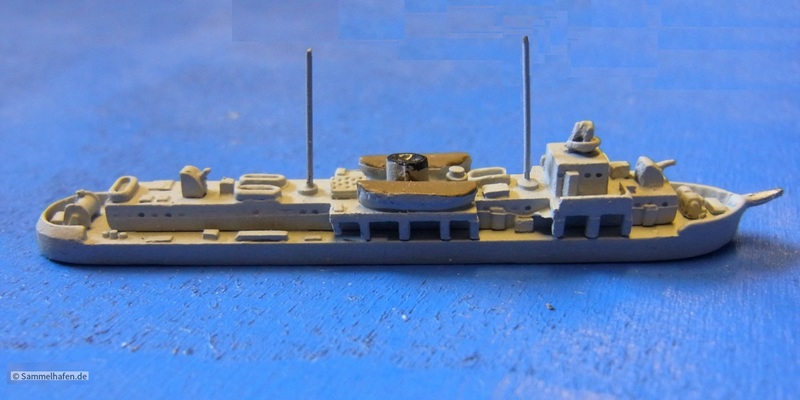 Scale model of Werkstattschiff Uta (Trident models, 2016). Image ©Sammelhafen.de. The Bechelaren was commissioned in 1932 as the President Masaryk, a river monitor of the First Czechoslovak Republic. 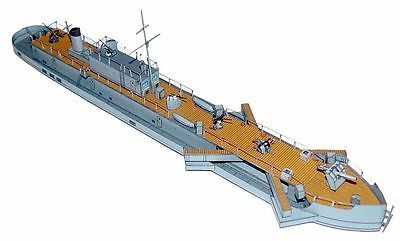 Armed with four 66-millimetre guns in two twin turrets, it was Czechoslovakia’s most powerful warship of the 1930s and flagship of the Czechoslovakian river flotilla. After the German occupation in 1939, the ship was taken into the German military under the name Bechelaren, initially based at Linz. The President Masaryk as she was when the flagship of the Czechoslovak Navy, 1932–1939. Length: 47.5m, beam 6m, draft a mere 1.07m. Propulsion: Twin steam turbines, 2300 HP in total. In 1943 the vessel returned to Linz and underwent extensive modernization. The hull was lengthened by 30 centimetres, the shape of the stern was changed and new machinery was installed, with the boilers and steam turbine engines replaced with two MAN submarine diesel engines having an output of 1,800 horsepower each. The funnels were removed and replaced with exhaust pipes on the sides of the vessel. The single rudder was replaced with two. Using space freed up by the changes in propulsion machinery, a quadruple mount with four 20mm flak guns was installed. 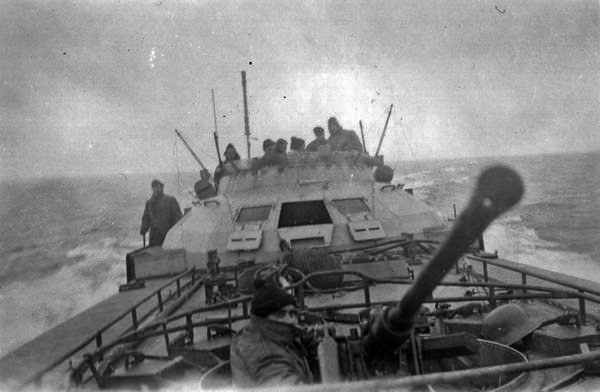 A separate 20mm cannon on the stern was replaced with a 37mm flak gun, and the machine gun turret at the front was removed. The Bechelaren after modifications in 1943/44. Early in 1944 the Bechelaren was returned to duty on the lower Danube. The modifications proved to be less than satisfactory; the new rudders gave poor control and the vessel, when propelled at its increased top speed, created a large bow wave that damaged the river banks. A second refit was attempted, during which four 66-millimetre guns were replaced with two 88-millimetre guns with light shields. This change of armament apparently came about because the 66mm ammunition was obsolete and out of production. The Bechelaren survived the war and was returned to Czech control minus its armament. The vessel was scrapped in 1978. At this point in our analysis, things inevitably became a bit more speculative. It is presumed that the Wehrmacht had no heavy weaponry on the North bank of the river between Dubovac and the Romanian border. Why would they, when the hill to the South-East of Ram gives a commanding view over the area? Furthermore, the modest quayside at Ram offered an opportunity for river craft of the Kriegsmarine to moor up, maybe even refuel, clear of the recognised channel and without being next door to an obvious fixed target such as the refinery at Smederevo. At the point where the river enters the gorge, the terrain rises more than 200 metres above the river level on both sides. Unknown – and unknowable in the absence of eyewitnesses – is the height at which the aircraft was flying before the flak ships opened fire. Thus it is not possible to determine whether the aircraft was lit up by the moon, or flying in the shadow of the hills that guard the entrance to the gorge. 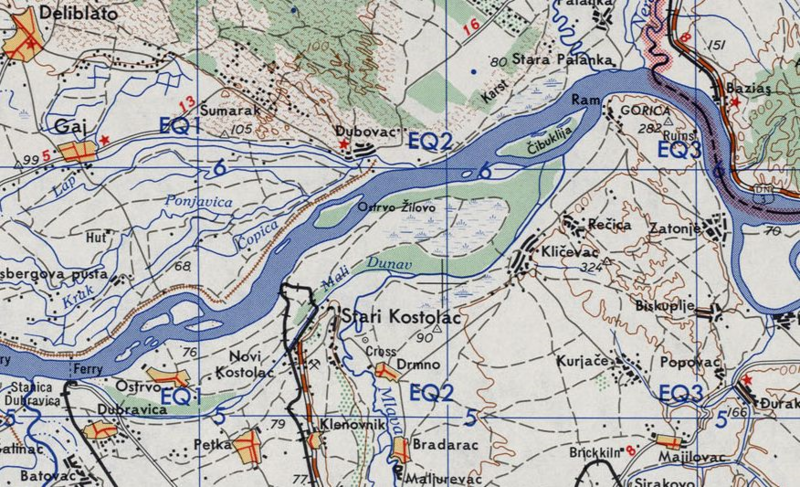 Extract from the US Army Map Service series M501, Sheet NL 34-11 Beograd. Archived by Perry-Castañeda Library (University of Texas), 101 East 21st Street, Austin, TX 78713, USA. Original scale 1:250,000. Date Sep.1960 (Copyright expired). Projection: Transverse Mercator. Scale as reproduced here: 10km between horizontal (Latitude) grid lines. Do not scale between lines of Longitude. Current estimate of crash position of MM838: Within that part of grid square EQ2-6 that is within the parish of Dubovac. Nearly a year passed before any indication emerged regarding the fate of the Beaufighter crew. No notification having been received through the Red Cross regarding the taking of Prisoners of War, death was presumed. It was customary for the Commanding Officer to write to the family of those under his command who were killed or went missing in action. With the consent of the next generation of both families, the letter from Wing Commander Stewart to Mrs Summers is reproduced here. Apparently unknown to his CO but reportedly known to James Summers at the time of his death is the fact that Phyllis Summers was pregnant with their first child. Private correspondence displayed here with the consent of both families. Not authorised for reproduction elsewhere. Use the magnifier controls of your browser to enlarge the images. Official notification of death was despatched by P.4(Cas) on 20th August 1945, apparently based on inaccurate information received from the post-war Yugoslav authorities. The claim was that the bodies had been buried with military honours at Kovin, but it wasn't true. Another nine months later, both casualties were found and officially identified back at Dubovac, in the field rather than buried in any local churchyard. Sloppy record-keeping, or deliberate disinformation? Anthony J Summers ("Tony", James Summers’ posthumous issue) duly put in his appearance in early 1945. When Phyllis re-married in 1948, Tony retained his birth surname of Summers. After our return from the April 2018 expedition to Serbia, one of the participants received a tip-off to the effect that the crew of MM838 did not die in the crash but were subsequently shot in circumstances that, if true, would constitute a war crime. Unsurprisingly, there is little evidence. Serbian military archives are only available for study by Serbian nationals, preventing us from conducting local research ourselves. In any event, much evidence of such things was destroyed in line with Tito’s policy of Forgive and Forget, one means by which he, as post-war military commander and later as President, successfully shut down ethnic rivalries in the Balkans for the next 35 years. In June 1945, when personal effects of the crew of MM838 were handed to the Air Attaché at the British Embassy in Belgrade, it was apparently without evidence of where and in what circumstances the artefacts were found. Ideally such recovery work would have been done by MRES, the RAF’s specialist "Missing Research and Enquiry Service", but they did not receive authorisation to work in Yugoslavia until August 1947. It remains a complete mystery as to how and why personal effects were returned in June 1945 but the bodies were not recovered until May 1946. Army "Graves Registration Report Form" W 3372 YS/RGD/2094 suggests that the bodies of Summers and Sanders were, in May 1946, found some 350 metres apart. No explanation is given and it is not possible to deduce from the information made available by CWGC whether or not any temporary burial in the field had been attempted, or how they met their deaths (EG impact, fire, explosion, shot whilst attempting escape, executed by firing squad). There appears to be no autopsy report, formal or informal. A site inspection, aimed at determining the relative positions of the debris field and the location where the bodies were found, might reveal more. Whilst the available evidence does not prove any breaches of the Geneva Conventions, it does not disprove the rumours either. Kaššák and Gunby (2017) report that 623995 F/Sgt Robert E. NORTH was shot by German ground troops. Army "Graves Registration Report Form" W 3372 YS/RGD/2097, generated by North’s exhumation in 1946, is silent on the matter. Still to be explored is the Burial Register of the Civil Cemetery in Veliko Gradište for September 1944. Ram Quay is almost certainly too far east for the Ustaše (the Croatian pro-Nazi militia) to have been involved in the death of F/Sgt North, but both Chetnik (pro-Monarchist) or Serbian Volunteer Corps (pro-German) paramilitaries might have been – the Chetnik possibility arising in consequence of the compact agreed between the two groups’ leaders Draža Mihailović and Milan Nedić the previous week. The possible presence of pro-Nazi Bulgarian Army forces (especially on the south side of the river) cannot be wholly overlooked; Bulgaria was still fighting on the Axis side until a little over a week later. At the time of writing (late October 2018) the individual Service Records of all 9 RAFVR aircrew aboard EW160 and MM838 remain closed, as do the Casualty ("AIR81") files of the six killed. Note that the B-24 bomber was carrying only 7 crew, not the full compliment of 10. On night-time "Gardening" missions, the positions of ball turret gunner and the two waist gunners were left unmanned. 1. ^ The UK National Archives: AIR27/1519 folios 80 side 2 and 85 side 2. The whole of AIR27/1519 is available online as a single .pdf file. 2. ^ Air Ministry Reference P.422640/1/P.4.A.2. Top copy in the Summers family archive has not been released for publication. 3. ^ Gunby, D. and Temple, P. (2018). Royal Air Force Bomber Losses in the Middle East and Mediterranean, Volume 2: 1943-1945. UK : Air Britain, p.162. ISBN 978-0-85130-509-7. 4. ^ E-mail, CWGC to 255 Squadron Association, 25 Oct 2018 at 14:48 UTC+1, unpublished. 5. ^ Galati Lower Danube River Administration, A.A., normally updated daily. 6. ^ TNA : AIR27/1519 folio 50 side 2. For online access see Citation No.1 Supra. 7. ^ Supplement to the London Gazette, 25 August 1944, Page 3953. 8. ^ TNA : AIR27/1120/15 folio 159 side 1. Available online. 9. ^ TNA : AIR27/1120/16 folio 177 side 1. Available online. 10. ^ Romanian Military History Forum. 11. ^ TNA : AIR27/1519 folios 80 side 2 and folio 85 side 2. For online access see Citation No.1 Supra. 12. ^ Transcript in the English Language is available on the Yale University website. 13. ^ Disclosure by Air Historical Branch in e-mailed letter to 255 Squadron Association dated 20.Aug.2018. Ref.D/AHB(RAF)8/27. Unpublished. 14. ^ British Army "Graves Registration Report Form" W 3372 YS/RGD/2094. 15. ^ TNA : AIR55/74 folio 43 (which comprises 5 pages). Original document – requires TNA Readers Ticket to view. 16. ^ Hadaway, S., (2008, 2012), Missing Believed Killed, Barnsley:Pen and Sword, p.98. ISBN 978-1-84884-659-3. 17. ^ TNA : AIR55/74 folio 129. (Telex message reporting arrival in Belgrade of Searcher Parties). Original document – requires TNA Readers Ticket to view. 18. ^ Daily Mirror, Thursday 23rd June 1966, Page 11 Column 1. 19. ^ Data from an extract compiled by Heribert Heilmeier, kept at the Schifffahrtsmuseum Regensburg. 20. ^ NARA roll T1022-4290, PG-31603, Kriegstagebuch und Anlagen des Chefs der Donauflottille, 01.09.1944–15.09.1944. 21. ^ NARA roll T1022-2585, PG-46123, KTB des Inspekteurs des Minenräumdienstes Donau 01.09.1944–15.09.1944. 22. ^ The problem of memory involving "schema". For an in-depth analysis of the resulting difficulties with witness testimony, see Sir Frederic Bartlett’s theory of reconstructive memory in: Bartlett, F.C., (1932). Remembering: A study in experimental and social psychology. Cambridge:Cambridge University Press. Predates ISBN system. 23. ^ The official reference of the document is missing/required. 24. ^ Possibly an indication that the ranges of aircraft of the RAF and Soviet Air Forces were beginning to overlap. In the dark, 255’s crews would have had no means of distinguishing between Axis and Soviet aircraft because the Soviets did not carry compatible IFF. 25. ^ Hinsley F.H. et al. (1979), British Intelligence in the Second World War. Cambridge : Cambridge University Press, p.913 et seq., Appendix 26. ISBN 0521351960. 26. ^ TNA : AIR51/243/4164 - "Yugoslavia: Smederevo". This file is available on open-access microfilm. No Readers Ticket is required, but as at October 2018 it has not been digitised. It is not available online. 27. ^ US Navy online calculator programmed for Dubravica (Дубравица), 44°43'N, 21°03'E. 28. ^ Supermoon data derived from Full Moon Perigee (Super Moon) Table courtesy of Fred Espenak, www.Astropixels.com. 29. ^ Kaššák, P. and Gunby, D. (2017 printed edition). Gardening by Moonlight. Bratislava:Degart. p.98. Proceed to Page 2 of 3, the Tony Summers’s account of the April 2018 Expedition.